Spray 3 1/2- to 4-quart slow cooker with cooking spray. Place chicken in cooker. Pour 1 cup of the Buffalo wing sauce over chicken. Cover; cook on Low heat setting 7 to 8 hours. Remove chicken from cooker; place in medium bowl. Place strainer over another medium bowl. Strain juices from cooker; skim fat from juices. Reserve 1 1/2 cups juices. Stir chicken to separate into pieces. Return chicken to cooker; stir in reserved juices. Increase heat setting to High. Cover; cook about 15 minutes or until thoroughly heated. Meanwhile, cut cucumber in half crosswise. With vegetable peeler, cut 1 strip of peel lengthwise from 1 cucumber half; discard strip that is mostly peel. Continue cutting thin strips lengthwise from cucumber, making about 18 strips. Repeat with other half of cucumber. Set strips aside. 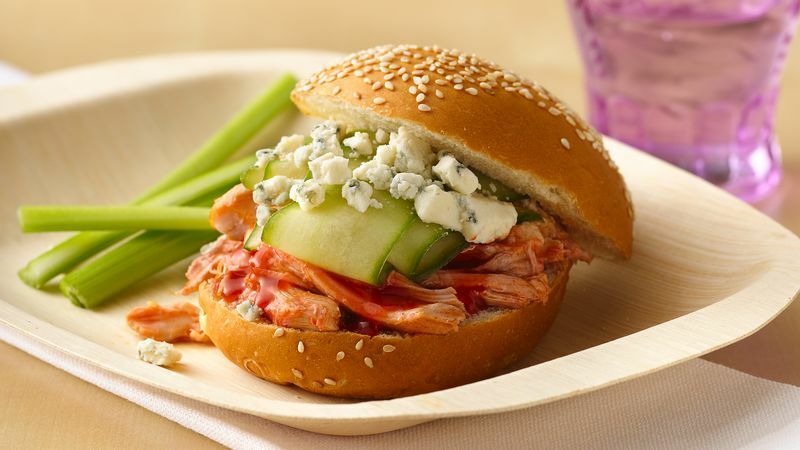 Fill each bun with 1/2 cup chicken mixture, about 3 strips of cucumber, 1 tablespoon of the remaining wing sauce and 1 tablespoon blue cheese. For a quick appetizer, fill purchased mini fillo shells with the chicken mixture, and top with finely diced celery and a dollop of creamy dressing. Are you blue at the thought of using blue cheese? Substitute another cheese if desired.